Abstract was appointed by Devonport Royal Dockyard Ltd, in early 2016, to construct a new Grade A office development within the Dockyard, to rehouse almost 800 Babcock Marine Sector staff from an adjoining, outdated office building. 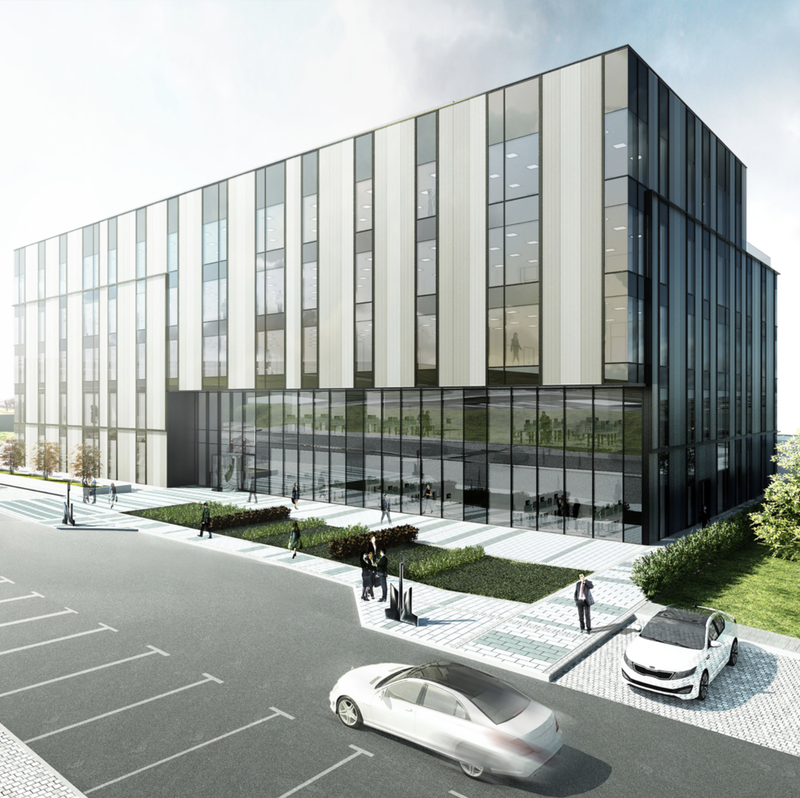 This is the second office development project Abstract has been commissioned to design and build for Babcock International Group, the first was at Rosyth Royal Dockyard in Fife which opened in May 2017. The development was completed, to full Cat B specification, in July 2018. The five storey building comprises almost 87,000 sq. ft. of offices together with parking for 232 cars and provides virtually column free floorplates of up to 18,000 sq.ft. The fitting out works include a roof terrace, VRF air-conditioning, gym, showers and staff restaurant. The building achieved its targeted BREEAM (2014) Excellent and EPC B ratings. Abstract was appointed by Rosyth Royal Dockyard Ltd, in summer 2015, to construct a new state-of-the-art Engineering Centre, to house 450 staff for the Babcock Marine Sector, as part of their ongoing investment programme on the Fife site. The development, named the William Rankine Building, was officially opened by HRH the Princess Royal in May 2017. The four storey office building comprises approximately 59,000 sq. ft. together with 229 car spaces and provides virtually column free floorplates of up to 17,000 sq.ft. It was completed to a full Cat B specification and includes a roof terrace, VRF air-conditioning, gym, showers and staff restaurant. The building has achieved BREEAM Excellent and EPC B ratings. Abstract joined forces with Nikal Ltd for a project in Salford, Greater Manchester and, as Abstract Nikal Ltd, in a joint venture with The Carlyle Group, purchased the former Colgate-Palmolive site for a multi-million pound office-led regeneration project. The 8.4 acre site, renamed Ivy Wharf, is well located within the Media City boundary providing space that appeals to both the creative industry and corporate occupiers alike. The existing factory building within Ivy Wharf was renamed Soapworks and was designed and consented to deliver over 400,000 sq. ft. of new commercial space, in three phases, to include contemporary office, media, hotel and complementary retail and leisure uses. The first two phases, comprising 230,000 sq.ft, are fully let to tenants including TalkTalk and the Home Office and the development was sold in Sept 2017 for £60m, some £5m in excess of the asking price, to the Greater Manchester Property Venture Fund, who plan to build out the final phase of the scheme. The Leonardo Building is the third in the new series of speculative office buildings to be developed and equity financed by Abstract. In May 2015 the building was fully let to Virgin Atlantic Ltd and was subsequently sold to F&C Commercial Property Trust Ltd at a price equating to £45.342 million and a net yield of 5.3%. The Building is located within the Crawley Business Quarter on a 3.2 acre site in the heart of Manor Royal just South of Gatwick airport. The site lies outside the area designated by Gatwick Airport for a potential runway expansion. The building has achieved BREEAM Excellent and EPC ‘B’ ratings. The building has been designed to achieve an occupancy as high as 1 person per 6 sq m and comprises of 110,000 sq ft over 4 storeys giving virtually column free floor plates of 28,000 sq ft. The building offers parking for 401 cars with scope for further provision. Construction started in September 2014 and completed in Q1 2016, including a Tenant’s Category B fit-out. Renaissance in Croydon is the first of a new series of speculative office buildings to be developed and equity financed by Abstract and achieved Practical Completion on 4 November 2013. Abstract’s perception is that occupiers are now looking for well located new buildings at highly competitive rents, offering the highest environmental specification and no compromise on Grade A quality, but avoiding any signs of corporate excess. This is the philosophy that has been adopted by Abstract with Renaissance and other projects currently under development. Prior to completion, the 100,000 sq ft building was sold as an investment to M&G Real Estate, underlining Abstract’s confidence in the Croydon market. The offices were fully let within 10 months of Practical Completion to the Pension Protection Fund, Mott MacDonald and Parabis Law. St Vincent Plaza in Glasgow is a new Grade A office building which is let to occupiers including KPMG, Whyte & Mackay, Wood Group, Mott MacDonald, Registers of Scotland and Zurich Insurance. There are two floors remaining comprising 26,910 sq ft. In Oct 2017, in one of the largest investment transactions in Scotland in recent years, a vehicle associated with private investment firm Starwood Capital Group, acquired the entire share capital of the Abstract subsidiary which owns St Vincent Plaza. In line with Abstract’s philosophy for ‘uncompromising value’ St Vincent Plaza has been designed to provide top-quality, city-centre office accommodation at highly competitive rents. Having been designed to accommodate an occupational density of up to one person per 6 sqm, the cost of operation per workstation is significantly lower than in competing Grade A office developments in Glasgow City Centre and any other major city in the UK. It provides very efficient and environmentally-friendly office accommodation delivered into a Glasgow office market where the supply of new Grade A offices has significantly reduced. Completed in Q4 2015, this striking building provides 172,000 sq ft of Grade A office space over lower ground, ground and 10 upper floors. A prestigious double height reception, concierge-style services and virtually column free, flexible floor plates from 12,000 to 17,000 sq ft with fantastic views, make this an exceptional workspace. In December 2004 Abstract, as part of a joint venture company, acquired the freehold interest in the former Trinity Mirror Post & Mail offices in Colmore Circus in the centre of Birmingham. Abstract then redeveloped the site into a new 14-storey office building of 307,056 sq ft called Colmore Plaza. Abstract financed this project from its own resources with the support of bank debt. The building was completed in January 2008, three months ahead of schedule. The building offered the largest (approximately 23,000 sq ft each) and most flexible floor plates in the City and the building’s construction is based on a City of London specification, providing a quality of accommodation which has not previously been enjoyed in Birmingham. This transaction won various awards including the 2008 BCO Midlands and East Anglia Commercial Workplace Award for the quality of the building, the 2007 Deal of the Year Award from Midlands Business Insider and the 2007 Deal of the Year Award from Midlands Property Week. In 2004, Abstract completed the development of two new office buildings in the City of London working with Hines (UK). The buildings are on the site of the former International Headquarters of The Salvation Army and part of the redevelopment of the site involved the creation of a new 35,000 sq ft International Headquarters facility for the Army. This building subsequently won the London City Architecture Award in 2006. The remainder of the site was developed into a separate 90,000 sq ft office building owned by Hines. This project had a value in excess of £65 million. Hines subsequently let the speculative building in full to Sumitomo Mitsui Banking Corporation Europe Limited and sold on the resultant investment to the State of Oman. Starting with a brief for the development of a 50,000 sq ft building as a replacement for a long-established presence in Chatham, Abstract conceived and developed what was to become two new 25,000 sq ft flexible office facilities for both Ins-Sure Services Ltd, a former subsidiary service arm of Lloyd’s of London and Lloyd’s themselves, enabling their relocation to the Chatham Maritime Enterprise Zone. Overcoming the engineering challenges of remediation and improvement to the flood defence of the former naval dockyard site, work commenced on the first of the efficiently-designed twin buildings in April 2005 and this was handed over to Ins-sure Services for fit out in January 2006. Abstract quickly followed this with the delivery of the second 25,000 sq ft building for Lloyd's of London, which included a high-quality fit-out to emulate the environment of their famous London HQ. This building was ready for occupation in September 2006. The inward investment generated from these combined projects meant the retention of over 500 jobs within the Medway area, an aspect welcomed by the authority and the Regional Development Agency. Mark Glatman established the Akeler Group of Companies in 1988 as a commercial real estate development group, providing office and high-tech industrial accommodation throughout the UK. By March 2000 Akeler had undertaken over 4 million sq ft of property development. Akeler established itself as one of the UK’s leading developers of business space throughout Europe. In 1998 he sold the Akeler business to Security Capital European Realty. 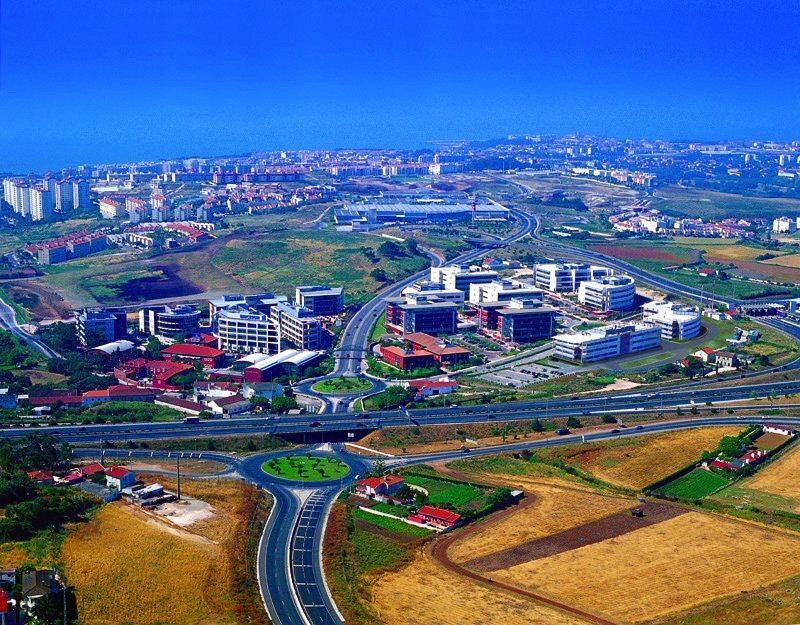 Akeler provided SCER with a base for its pan-European expansion, concentrating on investment in and development of offices and business parks for global blue-chip companies. Mark left the company in 2000. Doxford International Business and Technology Park, Sunderland - a phased 116,125 sq m (1.25 million sq ft) development which included call centres for One2One, Barclaycall, London Electricity, Subscription Services (The Post Office), Avco and Royal and SunAlliance. Reading International Business Park, Junction 11, M4, Reading - a 30,657 sq m (330,000 sq ft) landmark office development occupied by Verizon (MCI Inc). Quinta da Fonte Office Park, Lisbon, Portugal - a phased 66,000 sq m (710,000 sq ft) office park development which attracted such high profile tenants as Nokia, Microsoft, GE Capital, Elf, Proctor & Gamble, SAP and Cisco Systems. Akeler also developed business parks in Paris, Frankfurt and Munich. Akeler developed call centres for T-Mobile in Dearne Valley in central England, Merthyr Tydfil in Wales and Greenock and Dundee in Scotland. 215/217 Bath Road, Slough – two office buildings of 72,300 sq ft and 41,000 sq ft, constructed around a shared courtyard. The majority of the two buildings were let to Equant, the international data network provider, with Coca Cola and logistics specialist Frigoscandia also occupying space in the smaller building. 165 Bath Road, Slough - 45,462 sq ft of offices, pre-let to Lease Plan UK, a subsidiary of ABN Amro Lease Holdings NV. The development was subsequently sold to Britannia Investment Managers. This work by Abstract Securities is licensed under a Creative Commons Attribution 4.0 International License.